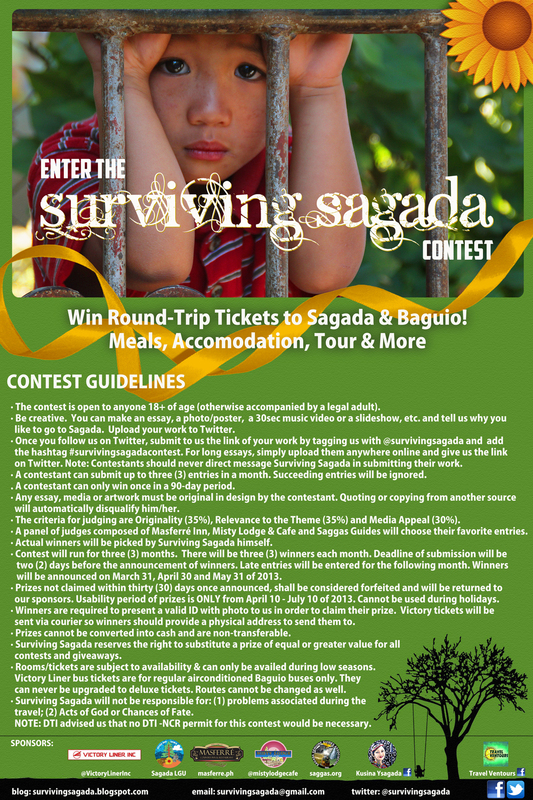 Enter the Surviving Sagada Contest and get a chance to go on trip to Sagada and Baguio for free! Before reading our Contest Guidelines, please make sure that you have fully read our Contest Mechanics. Contest starts on March 1, 2013 and ends on May 31, 2013. Winners will be announced and posted in our announcement page. We would like to thank our very lovely sponsors: Victory Liner Inc., the Municipality of Sagada, Masferré Inn and Restaurant, Misty Lodge and Cafe, Kusina Ysagada, Saggas Guides and Travel Ventours. Important: No DTI-NCR permit is necessary for this contest. For your questions, comments on the contest, follow us on Twitter @survivingsagada.